When I distribute content, the people in my market take notice. I’m not showing you this to brag. I’m showing you this to prove my content distribution system works. I follow a repeatable, scalable distribution strategy. I promote on the platforms and channels where my audience hang out. I use the latest content distribution tools to leverage my time. It sounds simple, but the devil is in the details. Below you’ll find the framework I use, with links to every part of my strategy. Bookmark this page now if you want to become a master content marketer. Content distribution is using *targeted* promotion methods to get your content in front of a *targeted* audience. There are three components you need for a successful content distribution system: True Fans, Free Traffic Multipliers, and Paid Traffic Multipliers. True Fans: This is where you build an audience of fans who wait in anticipation of every piece of content you create. You then distribute your content to them, and they share it. To get true fans, you need to attract people from your outer circle and social circle, into your inner circle. Free Traffic Multipliers: This is where you distribute your content using list multipliers (aka your owned distribution lists), social media multipliers (aka your social network), and across different channels using content multipliers. Paid Traffic Multipliers: This is where you pay to promote your content. You pay per click to get new traffic to your content using retargeting ads, social media ads, and native ads. 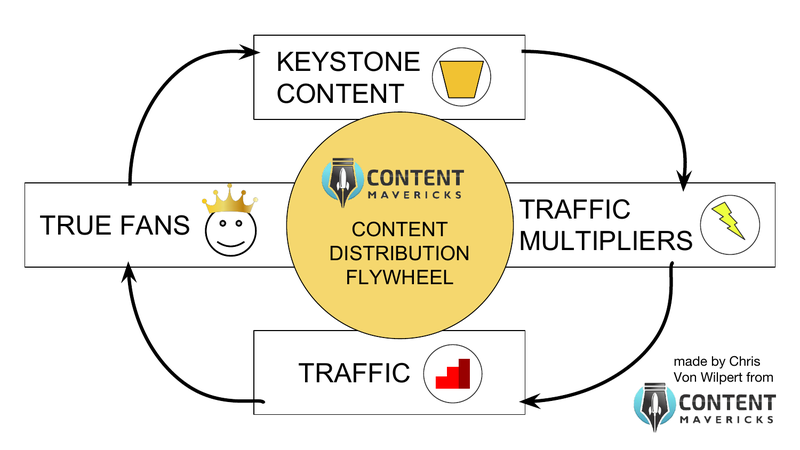 These three components are “The Flywheel” that drive consistent, compounding traffic to your content. To get your flywheel spinning you need to leverage the right platforms, channels and tools (aka “The Centipede”). Get targeted traffic to your content. Turn that traffic into true fans who subscribe and buy from you. 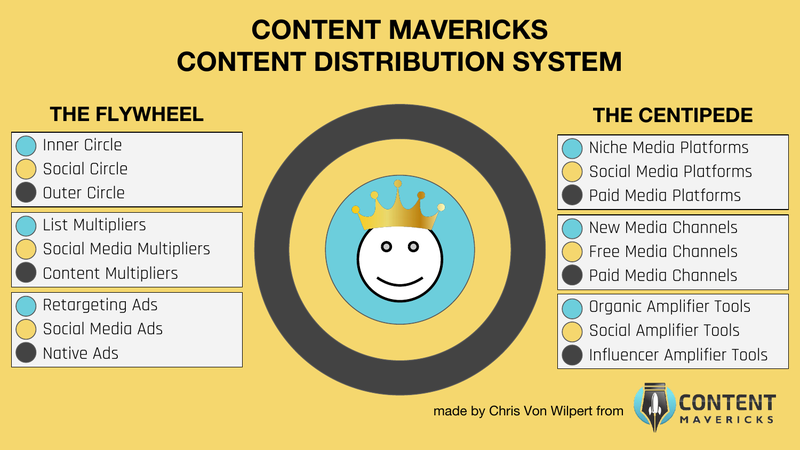 To do that you need a content distribution flywheel (not a funnel). 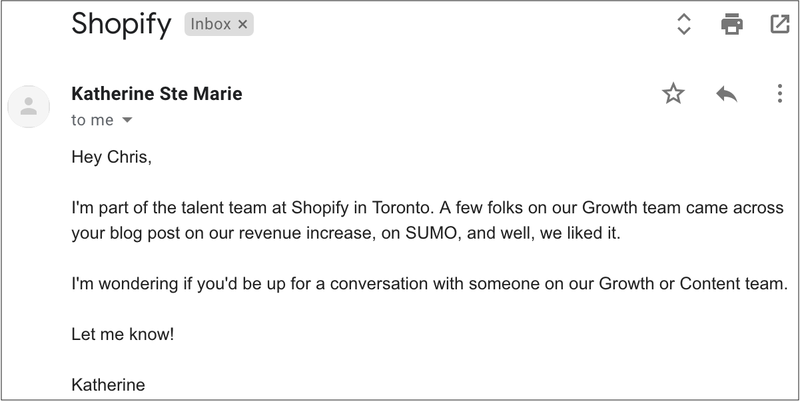 How to get 10x more traffic in 60 days to your content without spending 10x as much on ads (or producing 10x as much content). The 3 steps to exponential traffic growth (hint: 99.99% of traffic growth is linear). How to build an audience of 1,000 true fans, fast (practical steps). How to stop begging for backlinks and start going viral in your market. 3 free traffic multipliers you can use to get bulk free traffic to your content (perfect if you’ve got more time than money). 3 paid traffic multipliers you can use to get targeted paid traffic to your content (perfect if you’ve got more money than time). Read my step-by-step strategy in the free article below. Without knowing all the platforms, channels and tools you can use to distribute your content, you miss out on amazing traffic opportunities. 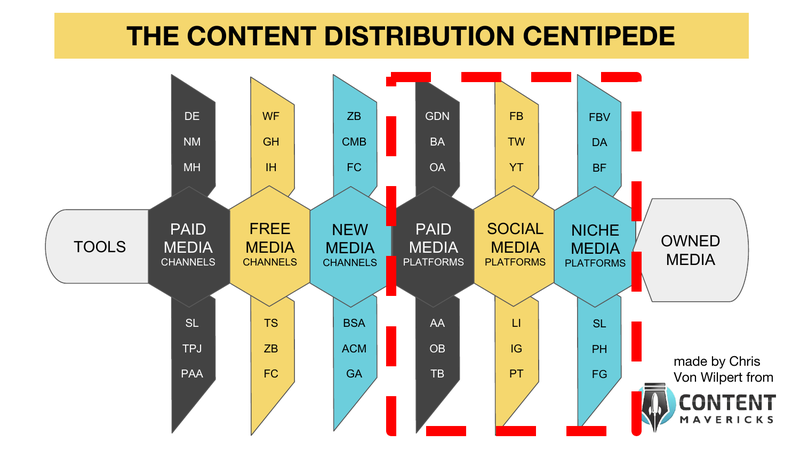 The Content Distribution Centipede is a diagram I created to illustrate the different platforms, channels, and tools people are using to distribute content on the web. 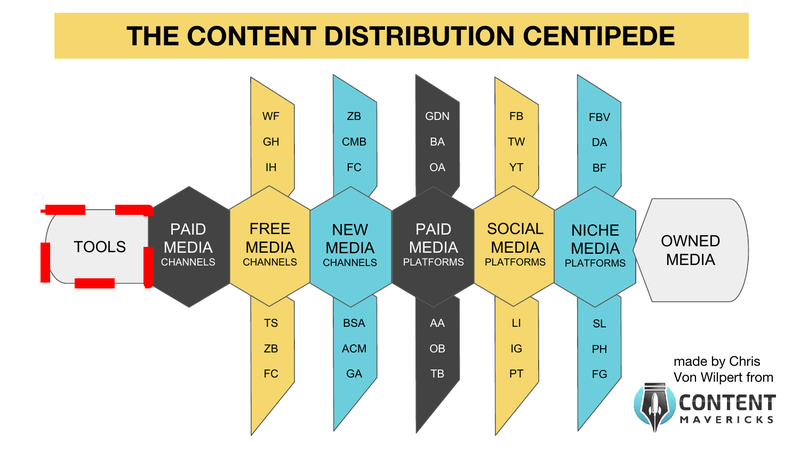 24 free content distribution platforms you can use to amplify your content without paying a cent. Read my complete list of platforms in the free article below. 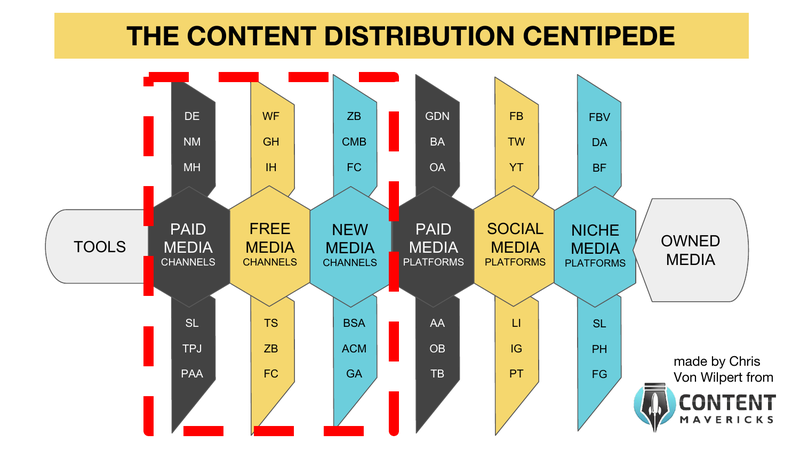 Want to know the best channels to distribute marketing content? Cryptocurrency content? Personal development content? I put together a list of all the new, free, and paid content distribution channels you can use across 13 niche markets. One new channel I used to get 450 clicks to one blog post in 10 days. Two unconventional channels where the world’s most famous dogs (and cats) will promote your content for you. Read my complete list of channels in the free article below. Sometimes all it takes is one little feature inside one tool to skyrocket your traffic to the next level. I put together a list of all the top content distribution tools I love. Inside there are instructions for how I use some of them to boost my own traffic. A tool I use to find out how much traffic a top Google result gets (so I can see if it’s worth my time creating content for it). Read my list of top tools in the free article below. There you have it… my complete content distribution system on one page! If you love what you’ve seen, give this post a share using one of the share buttons on the page, and tag me in the post @vonwilpert. Show everyone proof that more content ≠ more traffic. P.S. I recommend you bookmark this page and read all the articles in this series because you’ll learn all the little-known tactics and content hacks that have helped me grow clients sites to over 1 million visitors.